In the true spirit of Memorial Day, your local Central Coast Ace Hardware Stores is collaborating with the Veterans of Foreign Wars of the U.S. (VFW) to honor veterans by pledging to give out 1 million American-made flags nationwide. On Saturday, May 26, consumers are encouraged to visit 451 Main Street, Watsonville, CA 95076 Phone: (831) 724-4749 | 1820 Freedom Blvd., Freedom, CA 95019 Phone: (831) 724-4740 | East Lake Shopping Center, Watsonville, CA 95076 Phone: (831) 724-4795 | 1260 First St. Ste B, Gilroy, CA 95020 Phone: (408) 847-5890 | 265 Reservation Rd., Marina, CA 93933 Phone: (831) 884-9476 | 1561 N Sanborn Rd., Salinas, CA 93905 Phone: (831) 422-2233 to receive a free 8” x 12” American flag*, while a second flag is donated to their local VFW Post to be used for marking and honoring veteran graves this Memorial Day. *Flags will be available in participating Ace stores, while quantities last. In-store only. Limit one 8” x 12” flag per customer. No purchase necessary. For more than 90 years, Ace Hardware has been known as the place with the helpful hardware folks in thousands of neighborhoods across America, providing customers with a more personal kind of helpful. With more than 5,000 hardware stores locally owned and operated across the globe, Ace is the largest retailer-owned hardware cooperative in the world. Headquartered in Oak Brook, Ill., Ace and its subsidiaries operate an expansive network of distribution centers in the U.S. and also have distribution capabilities in Ningbo, China; Colon, Panama; and Dubai, United Arab Emirates. Its retailers’ stores are located in all 50 states, the District of Columbia and approximately 55 countries. For more information on Ace, visit acehardware.com or the company newsroom at newsroom.acehardware.com. The Veterans of Foreign Wars of the U.S. is the nation’s largest and oldest major war veterans’ organization. Founded in 1899 and chartered by Congress in 1936, the VFW is comprised entirely of eligible veterans and military service members from the active, Guard and Reserve forces. With 1.7 million VFW and Auxiliary members located in nearly 6,400 Posts worldwide, the nonprofit veterans’ service organization is proud to proclaim “NO ONE DOES MORE FOR VETERANS” than the VFW, which is dedicated to veterans’ service, legislative advocacy, and military and community service programs. For more information or to join, visit our website at www.vfw.org. This Saturday May 5th from 11am – 2 pm join your local Central Coast Ace Hardware and “Gather ‘Round the Grill” for Hot Dogs & Refreshments as well as Demos, Giveaways and More! 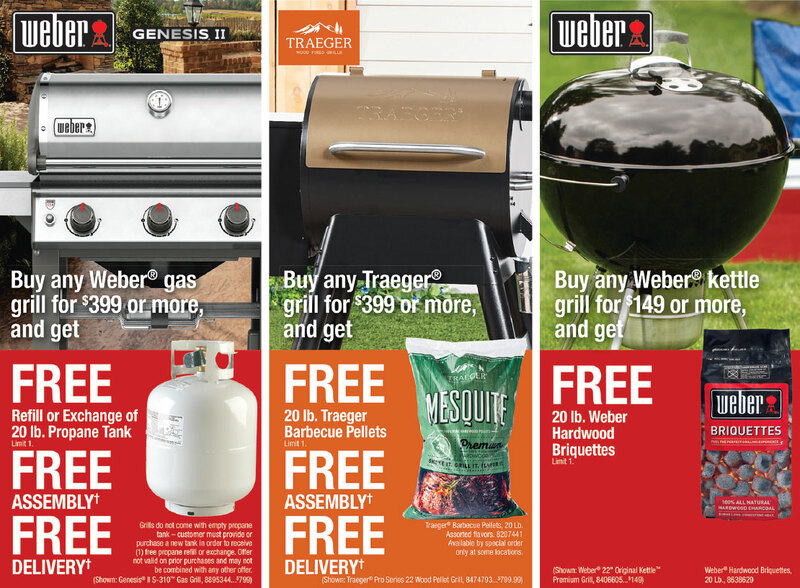 Don’t miss these Smokin’ Deals! Your Central Coast Ace Hardware locations include Watsonville, Freedom, Gilroy, Marina & Salinas. Our brand stands for helpful and I can’t think of anything better than helping sick children and hurricane victims. In addition to the amazing charitable work that Ace retailers perform in their local communities all across the globe, the Ace Foundation is a great opportunity for us to band together to support our two national charitable partners, Children’s Miracle Network Hospitals (CMNH) and the American Red Cross. As we enter a very busy 2018, I thought I would spend three minutes updating you on the amazing work that took place when Ace retailers, Ace vendors and Ace corporate team members work together to support two great causes. Our partnership with CMNH spans more than 26 years and during that time, you have helped us raise more than $93 million dollars that has gone straight to local hospitals all across the country. Money raised local, stays local! Approximately half of our donations help families that do not have the ability to pay for healthcare. Fifty percent of kids in the US don’t have adequate health care coverage. No child will ever be turned away from a CMNH hospital and we are helping to make sure that never happens. Approximately 25% of our donations help pay for life-saving equipment needed for children. The rest of the money we raise goes toward funding research, educating families on healthy and safe living and towards child-life areas of the hospitals. Cancer is 2nd leading cause of death for children and CMNH is pushing hard to drive more research on this topic. On any given day, more than 2,500 kids are being treated for cancer. Injury is the #1 leading cause of childhood death in the United States. CMNH Hospitals treat 16,000 children with trauma every day. Congratulations and thanks for making such a difference in the lives of so many kids and families across the country. The Ace family also jumped at the chance to help Hurricane victims in Texas, Florida and Puerto Rico during 2017. The number of calls and emails that poured in from retailers and corporate team members asking what they could do to help, willing to do just about anything, reminds us why Ace is such a great place. Retailers all across the country turned on change Round-Up to help hurricane victims through the American Red Cross. In a very short period of time, more than $850,000 was raised. In addition to these monies, approximately $500,000 of tarps and buckets were donated to help with the cleanup efforts in Texas and Florida. I believe it’s safe to say that you covered a lot of rent in 2017.